Top panel/ Side panel/ Drawer front/ Plinth front/ Front rail: Particleboard, Oak veneer, Tinted clear acrylic lacquer Back: Fiberboard Support rail, back/ Shelf: Particleboard Drawer bottom: Fiberboard, Printed acrylic paint Mirror glass: Glass Protective fabric: Polyester fiber fill - Product dimensions Width: 15 3/4 " Depth: 19 1/8 " Height: 48 3/8 " Width: 40 cm Depth: 48.5 cm Height: 123 cm This product requires assembly - Of course your home should be a safe place for the entire family. That's why hardware is included so that you can attach the chest of drawers to the wall. Built-in mirror. 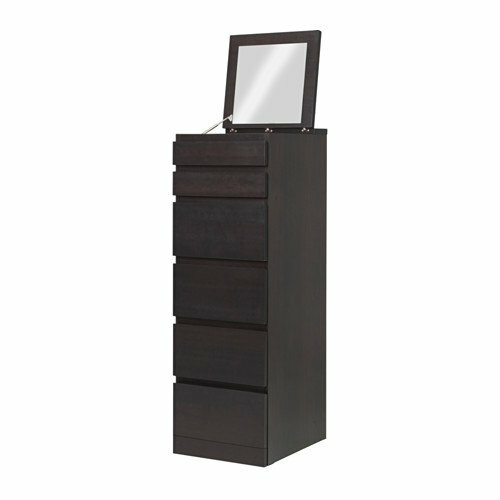 There's a felt-lined compartment beneath the mirror that's perfect for storing your watches and jewelry. This high chest gives you plenty of storage without taking up too much room. Real wood veneer will make this chest of drawers age gracefully. Smooth running drawers with pull-out stop. - Care instructions Frame Wipe clean using a damp cloth and a mild cleaner. Wipe dry with a clean cloth. Mirror glass Wipe clean with a damp cloth. Use only water or window-cleaner. Wipe dry with a clean cloth. - Of course your home should be a safe place for the entire family. That's why hardware is included so that you can attach the chest of drawers to the wall. - Smooth running drawers with pull-out stop. Built-in mirror. There's a felt-lined compartment beneath the mirror that's perfect for storing your watches and jewelry. - Real wood veneer will make this chest of drawers age gracefully.